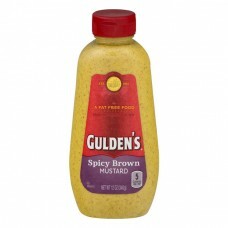 Gulden's® Spicy Brown Mustard. Est. 1862. American Institute New York 1869. A fat free food. See nutrition information for sodium content. 5 calories per 1 tsp. Net wt 12 oz (340g). Try the great taste of Gulden's on: sandwiches, hot dogs, hamburgers, pretzels and in your favorite recipes. ConAgra Foods®, food you love. Produced with genetic engineering. Questions/comments: 1-800-544-5680. P.O. Box 3768, Dept. GM Omaha, NE 68103-0768 U.S.A.